Buongiorno a tutti! 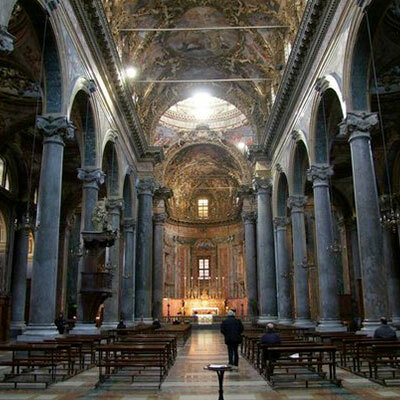 Your semi-official host and travel guide is back to show and tell you all about the Quattro Canti — Four Corners. I believe this is one of Sicily’s most interesting attractions, and I hope you will feel the same way. A square stands at the intersection of two of the most prominent streets in Palermo, Via Maqueda, and Via Vittorio Emanuele. This baroque square formed in an octagon is known officially as Villena Square to honor the Spanish Viceroy who commissioned this construction in 1609. His full name was Marquis de Juan Fernández Pacheco de Villena y Ascalon. You can see why people just call it Villena Square instead of trying to spill out all the rest of the Viceroy’s name. You have probably already read that Palermo has the honor of being the most conquered city in the world. That being said, it’s obvious that we have also had an endless number of different sovereign rulers over the centuries, and among these, were of course the Spaniards, who, with the British, pretty much ruled the seas at one time. This intersection and square acquired the name Four Corners because of its four eighteenth-century palaces. The convex façades have been skillfully decorated making this square quite unique in the Belpaese. The four façades represent the cantons and have been adorned on multiple levels, featuring decoration based on the classical Doric, Ionian and Corinthian architectural orders. Viewing the façades, one begins at the bottom and follows the ascension up to heaven. On the lower level a sparkling fountain represents one of the ancient rivers that once flowed through Palermo. These are Papireto, Kemonia, Oreto, and Pannaria. Now above each fountain you will see a different figure at each corner. Each depicts one of the four seasons. Most people don’t know their names, which are Eolo, Venus, Ceres and Bacchus. Then above the four seasons are the four different Spanish sovereigns, Charles V, Philip II of Spain, Phillip III of Spain, and Phillip IV of Spain. Looking even higher, at each corner, you will find one of Palermo’s four holy patron saints before the arrival of Saint Rosalia: Saint Agatha, Saint Ninfa, Saint Oliva, and Saint Cristina. Backing the eighteenth Century, the Quattro Canti formed the heart of Palermo. The four ancient districts of Albergheria, Capo, Kalso and Vucciria all converged at Villena Square. In those days, the Four Corners was praised as a “theater of the sun” thanks to the soft play of sunlight on the four façades of the palaces. But today, any possible plays of light are destroyed by a constant rumbling of cars moving around bumper to bumper. The polluted air has, over the years, literally changed the color of the four palaces, all this giving the square an air of faded charm and grandiosity. To give you an idea of our past, way back in the 1600s, Spain had its turn at ruling Sicily. At that time the Spanish Viceroy Marquis of Vigliena completely redesigned the region and had a road built to intersect with the old Cassaro (via Vittorio Emanuele), and named it Via Maqueda in honor of the Marquis’ predecessor, Bernardo Cardenas, Duke of Maqueda. It followed then that this cross road quickly formed the heart of the city and between 1608 and 1620 the four marvelous palaces appeared, all adorned with the rare and beautiful baroque sculptures designed by the architect Giulio Lasso. The Four Seasons represented by the façades of the four palaces were perhaps the inspiration for Vivaldi’s master work of musical genius. Aside from that, they also represent the Spanish kings and various patron saints. At ground level, the fountains with their sculptures were designed by a collective of talented local sculptors of the era. D’Aprile, La Mattina and Tedeschi were among them. Unfortunately, exhaust emissions have nearly ruined the beauty of the square. Today, the lovely façades are nearly black, but their beauty still shows. The best part is that to visit the square is free and you can visit it at any time, day or night. And despite the pollution, most visitors spend half an hour or more admiring the palaces and photographing the four façades. The Quattro Canti seems also the headquarters for money-hungry operators with their horse-drawn carriages. It is not uncommon for them to charge at least €60 for a one-hour ride around among the polluted and busy streets of Old Town. If you really want a carriage ride, you can find a tour operator for a similar ride at less cost to you. Just down from the southwest corner, the gracefully exuberant baroque San Giuseppe dei Teatini Church overlooks the square. Saint Joseph, created by Baldassarre Pampillonia in 1738 dominates its façade. But that’s only the exterior. You really have to go inside where you’re gonna be stunned by the overwhelming colors, fillers, bas-reliefs and décor. Frescoes by Filippo Tancredi and Giuseppi Velásquez adorn the nave as do pieces by Ignazio Marabitti, Pietro Novelli and Guglielmo Borremans. Not open to the public, the crypt, according to legend, says that a mysterious and miraculous water gushes forth from an unknown source. 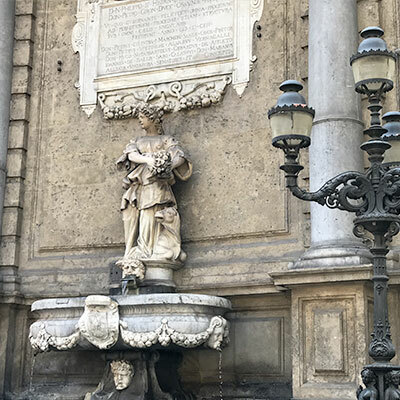 And there is one more things you should see before leaving the Four Corners, and that would be The Fountain of Shame, located just behind the Quattro Canti. 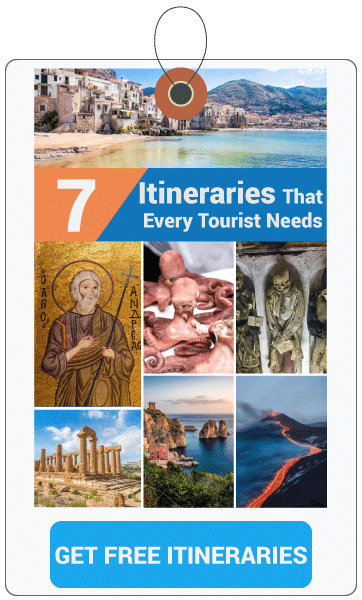 Actually, the Four Corners form the hub for almost all the must-see attractions in Palermo. This is a great neighborhood for you to enjoy your hotel stay and you’re gonna find plenty of restaurants, cafés and bars where you can get a good glass of Marsala or perhaps you can try an Italian cocktail. And now, old Don Tano has to go help wash the dishes. In the meantime, don’t be shy. If you have any comments or questions, be sure to let me know.